Completely gluten free, grain free and vegan. 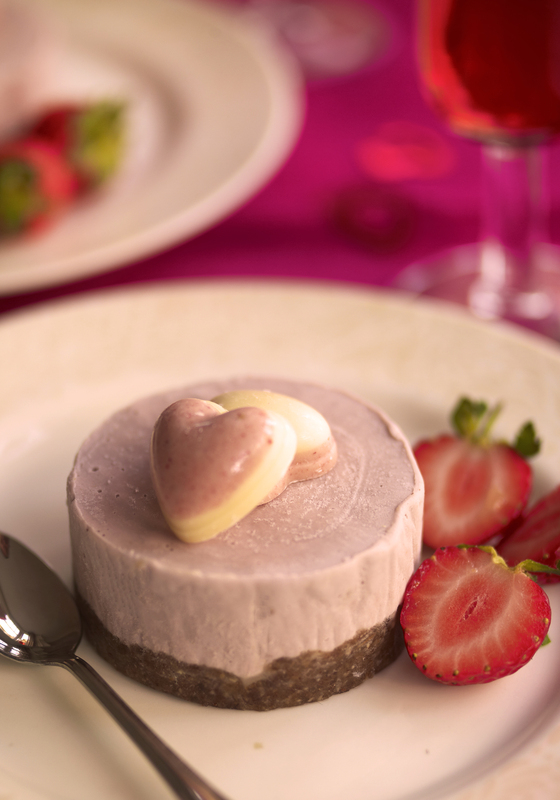 Top with a fresh sliced strawberry or chocolate heart for a truly romantic treat. 1. Grease 6 metal rings and line the sides with a strip of baking parchment. Place on a lined baking sheet. 2. To make the base grind up the pecan nuts in a food processor until very fine. Add the dates and coconut oil and process to form a sticky dough. Divide the dough between the metal ring bases and press down firmly to form a crust. 4. To make the filling place all the ingredients in a blender and process until smooth and thick. Divide the filling between the metal rings. Return the rings back into the freezer and freeze for 1-2 hours until firm. Carefully remove the rings and place the desserts on individual serving plates. 5. Place in the fridge and allow to defrost for an hour before serving. They can be kept in the fridge until needed. 6. Top with berries or a chocolate heart to serve. It’s the worst thing. Forgetting pancake day and having to do it all a day later. So don’t forget, Pancake Day is Tuesday 12th February. Be prepared and make sure you have all the gluten free ingredients you need in your cupboard. There’s lots of extra toppings to indulge in too, such as maple syrup, lemon juice, chocolate sauce or natural sweeteners. Combine dry ingredients in a mixing bowl and thoroughly blend through. Combine buttermilk, oil, egg and vanilla in a separate mixing bowl. Whisk to combine. Stir milk mixture into dry ingredients adding it gradually. Whisk until batter is smooth. If batter looks too thick, add more milk a teaspoon at a time until the consistency is ok.
Lightly brush the frying pan or skillet with olive oil and heat on a medium ring. Pour a measure of batter into the pan an allow it to spread. 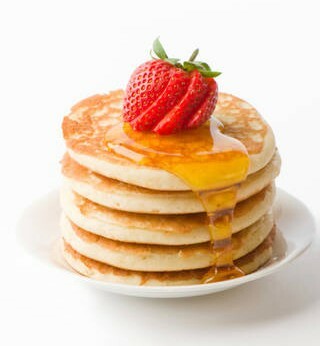 Once bubbles have begun to form on the top and the bottom is golden brown, flip the pancake to cook the other side until golden. Serve with your desired topping! Pour milk, eggs and melted butter or oil into a blender pitcher. Pulse until combined. In a small bowl mix gluten-free buckwheat flour, gluten-free flour and salt and add to liquid in blender, pulse until combined and smooth. Allow batter to rest for two hours for the best results. Serve with what ever topping tickles your fancy! Nutritionist, Christine Bailey, has an easy store-cupboard dip or spread which takes just minutes to prepare. Perfect for the party! Rich in antioxidants and essential fats this is packed full of protein and nutrients. With a creamy sweet taste it combines omega rich walnut oil and balsamic vinegar to create a wonderful dairy free dip. 1. Place the paprika, garlic, walnuts, peppers in a food processor or blender and process until finely chopped. 2. Add the rest of the ingredients and blend until smooth. 3. Adjust quantity of vinegar and xylitol according to taste. Season with a little black pepper and sea salt. Nutritionist, Christine Bailey, cooks up a flavoursome gluten free sweet soup, combining antioxidant rich vegetables with juicy pears. Winter squashes and sweet potatoes are crammed with cancer fighting, cardio-protective nutrients. Rich in carotenoids plus vitamins C and E – valuable antioxidants for the skin, eyes, lungs and immune system. A great source of soluble fibre to aid digestion and full of anti-vital and antibacterial properties great for the immune system. To make this more substantial add a tin of cooked butter beans and puree until smooth. Alternatively accompany with some additional protein such as lean ham or cheese. Storage: Make in advance and store in the fridge for up to 3 days. Freeze in batches for up to 1 month. 5 tbsp low fat crème fraiche (omit if dairy intolerant or can add a little soy yogurt before serving). 1. Heat the oil in a large pan. Add the onion and cook until softened. Add the rest of the ingredients except the crème fraiche and simmer for 25 minutes until the squash is tender. 2. Puree in a food processor. Return to the pan and stir in the crème fraiche. Season with black pepper and warm through to serve. Yesterday we featured a recipe for homemade mince pies made with Sweet Freedom – a great ingredient which can be used instead of sugar. Here’s a gluten free version. Check yesterday’s post for the mincemeat recipe. 1. Preheat the oven to 170C/Fan 150C. 2. Place the flours into a bowl with the butter. Using your fingertips, rub the butter into the flour until it resembles breadcrumbs. Mix in the ground almonds and baking powder. Next, add the remaining ingredients and cut them into the flour with a knife, then bring the pastry together into a ball with your hands. 3. Take two thirds of the pastry and roll out thinly between two sheets of cling film. Using the larger cutter, cut out rounds and use them to line the bun tray. Fill with mincemeat and then roll out the remaining pastry, again between cling film, and cut out rounds with the smaller cutter. Place the lids on the pies and lightly press down with the palm of your hand to seal them. 4. Bake in the preheated oven for 15-20 minutes or until the pastry is golden brown. Leave to cool slightly in the tin before transferring to a cooling rack. It was ‘Stir Up Sunday’ last weekend, so high time to make your Christmas Puds. This would apparently remind cooks and housewives around the country to make sure they’d mixed their Christmas Pudding ingredients which, as everyone knows, should be prepared the day before you steam the pudding. You couldn’t make this stuff up! Using Sweet Freedom Dark, made 100% from fruit in place of sugar, turns this traditional Christmas pudding into a healthier finale to your Christmas meal. You will need a 1 litre (approx 2lb) pudding basin or spherical pudding mould. In a large bowl mix together the raisins, currants, suet, breadcrumbs and grated carrots. Then mix together the Sweet Freedom, Guinness, Brandy and eggs and pour onto the fruit mixture. Stir well until combined, cover and leave in a cool place overnight. The next day, grease the basin or mould with butter or oil and place a small circle of non stick baking parchment in the bottom of the basin or in the top and bottom halves of the spherical mould. Stir the pudding (don’t forget to make a wish!) and press into the basin or mould. If you are using a basin, cover with a piece of baking parchment followed by tin foil and tie with string. Steam for 8 hours, keeping the water in the pan topped up with boiling water. Leave to cool and if you’ve used a basin, remove the baking parchment and foil and re-cover with new paper and foil. Keep the pudding in a cool place until Christmas day. On Christmas morning, steam the pudding for at least an hour before serving. Use 150g of ground almonds instead of the breadcrumbs and omit the Guinness and use 60ml of Brandy instead. Some suet does have flour as an ingredient, so do check. Gluten free vegetable suet is available at GoodnessDirect. To Flambe the pudding – warm a little brandy or vodka, pour over the pudding and carefully set alight. The timing relates to ‘hands on’ time, rather than the long periods of preparation and steaming. If you’re looking for a cooking alternative to milk, you might want to try amazake. It’s so deliciously thick and creamy it is hard to believe its made from dairy free ingredients! 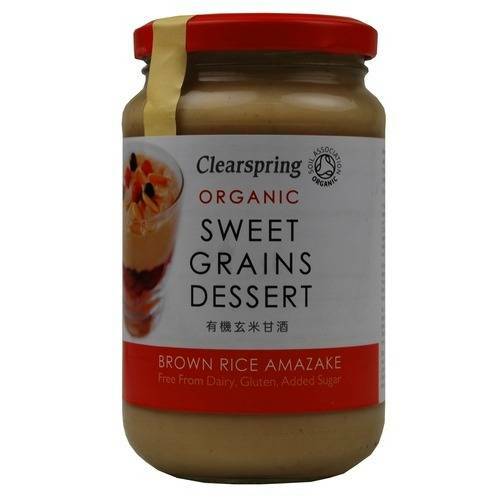 Try using amazake for making pancake batter, muffin mixes or dairy free French Toast. Or you can mix it into your fruit smoothie. Also available, with their own distinctive flavours, are oat and millet amazake. A light, but satisfying dairy-free dessert for serving all year round. 1. Mix all the ingredients except for the kuzu and bring to the boil whilst stirring. 2. Dissolve the kuzu in a little water then add to the hot liquid stirring until thick. 3. Serve into individual dishes, cool and garnish with the orange slices.